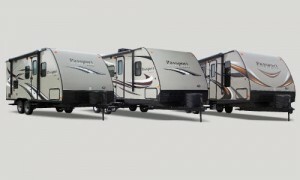 The Passport line up of travel trailers includes a wide range of floorplans made to accommodate a variety of RVers. These lightweight travel trailers are easy to tow, include practically laid out interiors, and don’t skimp on comfort. Read our Passport travel trailer review and check out these great floorplans below to learn more. 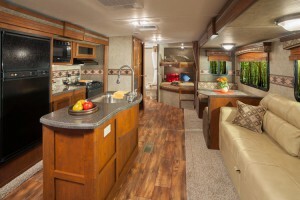 The perfect couple’s coach, this floorplan sleeps up to 4 people and is 26 feet long. It boasts a huge bathroom that includes a tub/shower, vanity and sink, and a toilet. At the front of the RV is a queen sized bed with two wardrobes and overhead storage. The front exterior includes large pass-thru storage. An outside kitchen includes a refrigerator and sink. Inside, you’ll appreciate the double sink, refrigerator, and three burner range. Need space for the entire family? This floorplan can sleep 8 people making it ideal for anyone who has lots of kids or wants to bring along guests. And at only 29′ long it is incredibly easy to tow. One slide in the living room includes a booth dinette and a fold down sofa with overhead storage. At the back of the RV you’ll find double bunks. Near the bathroom there is a large pantry for easy storage, while the front bedroom includes a queen sized bed and two wardrobes. With this floorplan the 2650 is perfect option for active families. Enough space for 6 people makes this the perfect floorplan for families. It boasts a 30 gallon fresh and black water capacity and 60 gallon grey water capacity. Along the back of the RV you’ll find a linen closet, while the exterior includes a refrigerator and sink. An island with a double sink makes preparing meals and staying organized easier than ever before, while a slide with a fold down sofa and dinette expands your living space and promises comfort wherever you are. If you want to learn more about these floorplans contact us or view our selection online. We can answer any questions you have and make sure you’ve got the information necessary to make the best buying decision for your needs.